This may be the very worst moment of your life. Has your car crashed, crumpled and burst into flames? Do you see signs that an interloper has ransacked your home? Do you smell smoke? Has a loved one collapsed and stopped breathing? What do you do first? Call 9-1-1. It’s more than a reflex. In the 51 years since the emergency phone number was introduced nationwide, counting on the calm, professional voices on the other end of the call has become so much a part of American life that it’s the universal key to coping with crisis. That confidence that help will come – the kind of help you need from whoever can get there first – is so unshakable that most people barely think of the dedicated men and women who answer those calls and the complex technology that enables them to find you. Today Red River Dispatch is unique among the nation’s 6,500 emergency call centers: It’s the only one whose responsibilities cross state, county and municipal lines, encompassing vast rural as well as urban territory and a combined force of seven police departments, two county sheriffs, three city fire departments, 27 rural volunteer departments, F-M Ambulance and 15 rural EMS (emergency medical service) providers. In the space of just minutes, the seven operators on rotating round-the-clock shifts must determine the caller’s location and the nature of the emergency, updating first responders even as they gather information over the phone. They often stay on the telephone as law enforcement, fire and ambulance sirens pulse and their lightbars flash on the way – calming the callers and often coaching them in what to do until the pros pull up outside. Mary has felt the impact and learned that lesson over and over since, as a 19-year-old young mother, she went to work in the old Moorhead-Clay dispatch center in the basement of the now-demolished former law enforcement center. She’d grown up in Park Rapids as the eldest of seven brothers and sisters, all born within less than nine years. “I was used to taking charge,” she says with a smile. “Our mother was a nurse and our father a volunteer firefighter, so I was kind of used to the work. Throughout her tenure, her husband Jay switched his college major from teaching to law enforcement, eventually serving ten years as a Moorhead police officer. He eventually went back to school for a doctorate in psychology and now works at the Veterans Administration. One of Mary’s brothers and her brother-in-law went into police work, too, but have by now moved on. “I’m the only one who’s stuck it out,” she points out. Much has changed in three decades. “It’s like night and day,” she reflects. Keyboards have replaced the detailed notes she originally logged by hand; instant digital updates with officers, firefighters and medics via computer have largely replaced radios. But nothing has changed the 9-1-1 landscape as profoundly as cellphones. “When people called on land lines, we instantly knew who was calling and where they were located,” Mary explains. But the advent and widespread adoption of cellphones changed all that, adding an obstacle to the near-instant response that’s the ideal. “Originally we could only pinpoint the tower. The most important question to ask was, ‘Where are you?’ A lot of 9-1-1 callers couldn’t exactly tell us,” she says. Improvements have come along, though the system isn’t perfect and doesn’t necessarily extend to all phones and carriers. Last month, Red River Dispatch became the first PSAP (public safety answering point) in North Dakota to adopt the NG911 Clearinghouse’s RapidSOS, which pinpoints location more closely. However, it only works with iPhones operating iOS 12 and Android phones running version 4.0 and higher. 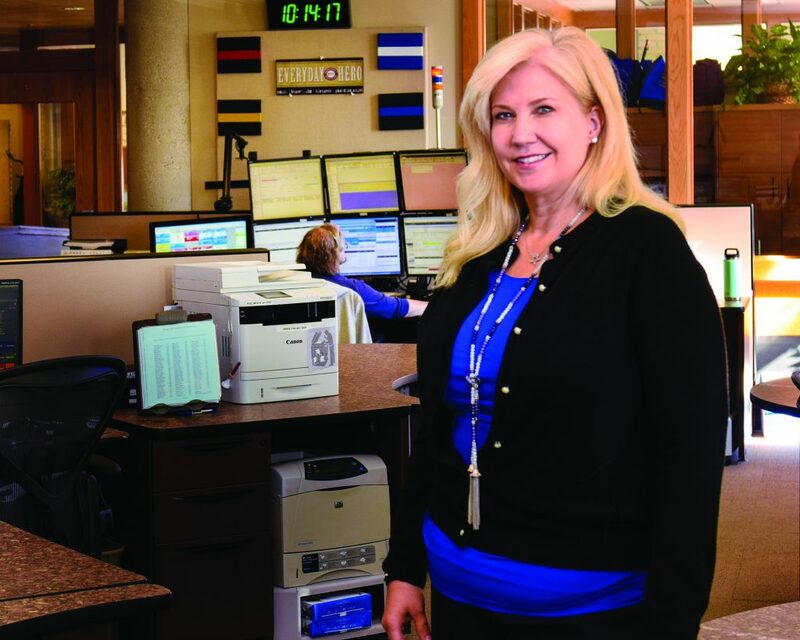 At the same time, she cautions that potential callers shouldn’t hesitate to dial 9-1-1. “We hear people say, ‘I don’t know if this is really an emergency.’ It’s pretty common here, especially with our humble Norwegian and German backgrounds,” she says. “We don’t like to feel we’re bothering someone.